Clash of Clans is one of the most famous multiplayer strategy game in the mobile world. It’s been years but still COC has maintained its charm and excitement among the players. Though recently after the release of Clash Royale, another game from the same developer (Supercell), COC got back seated but that was just for a couple of months. People are coming back to Clash of Clans and rebuilding their bases and developing many new attacking strategies. This year, Supercell has introduced many new troops, a new level of defences and many game balancing changes, which has completely changed the way people used to play the game. In last few updates, Healers has been nerfed a bit, as they are now exposed to air traps. This also has affected the Queen Walk. Remember, how people with high-level Archer Queen start off with a Queen Walk and destruct up to 30% of the base alone. But now the attacker cannot depend on Queen Walk alone, as there are high chances that Healer gets early death by triggering max-level air traps, and in no time your whole strategy might ruin. A year back, Witches were the most dangerous troop in COC wars, but they were nerfed and are almost useless now. It’s been months that we haven’t seen any “mass witches” attacks or GOWIPE attacks in TH9 and above. Right now “Valkyrie” is the most dominating troop in TH9 and TH10. Though the introduction of Miners and Bowlers has shifted the interest of players and now war attacks are mainly comprised of “Mass Bowler” or “Mass Miner” attacks. But these troops are very expensive and may drink your Elixir/Dark Elixir in no time. Therefore these attacks are not recommended for farming, especially if you are in lower leagues. Recently I have been very active in Clash of Clans and has farmed a lot to upgrade my troops and defences. Not to say that I am a gemmer, and I only have started COC from last 8-9 months. Its been a month that I have upgraded to Town Hall 10 and I already have maxed almost all troops. But I have missed my Heros as they require too much of Dark Elixir, but now I am only concentrating on my Archer Queen, and soon it will hit level 30. You can say that I am a TH9.5 with almost max TH9 defences and TH10 troops. But now I also have added Inferno in my base, and it will take six more days to complete the construction. So here I will tell you how you can farm in TH9, TH9.5 and TH10. 2 Heal, 1 Rage, 1 Jump, 1 Freeze and 1 Poison Spells. 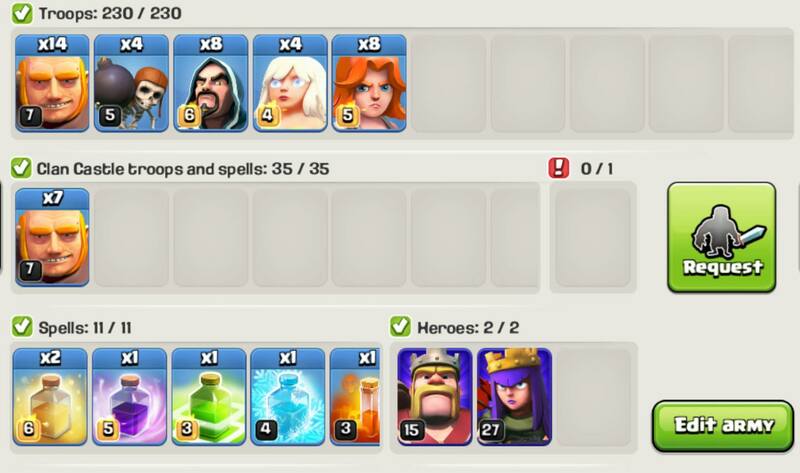 Clan Castle Troops: Giants and Any Spell. So in every raid, I use the above-mentioned army and trust me it is a great army composition even if you are in Champions League. First of all start with a Queen Walk. Make sure that healers are not exposed to Air Defences. After Queen has cleaned up 10-15% of the base, make a wide funnel by using 4-6 giants and 5 wizards. Now use wall breakers to open up the first layer of wall and drop the jump spell to access the core of the base. Drop other Giants followed by King and Wizards. You can use a heal spell if needed. Now you are safe to drop Valkyries, so that they directly jump upon to the core to take out the X-bows and Inferno Towers. Use the Rage spell as soon as the Valks come into the contact of first Inferno tower. Now use Freeze Spell to freeze the second Inferno Tower, at the same time use Heal Spell to heal all your troops to full health before the Freeze Spell expires. Keep an eye on Queen and King. Do not forget to use their ability. If everything went as expected, then you can expect a 3 star or high 2-star raid. Try to search for a dead base as they have plenty of loot available and is easy to 3 star, which means 100% loot bonus. Take enough time to search for a good base, it will hardly take 5 minutes to search a million loot base. Recently there has been many dead bases, as more and more people are tending towards Pokemon Go and Clash Royale. Keep your trophies between 2000 to 3000. 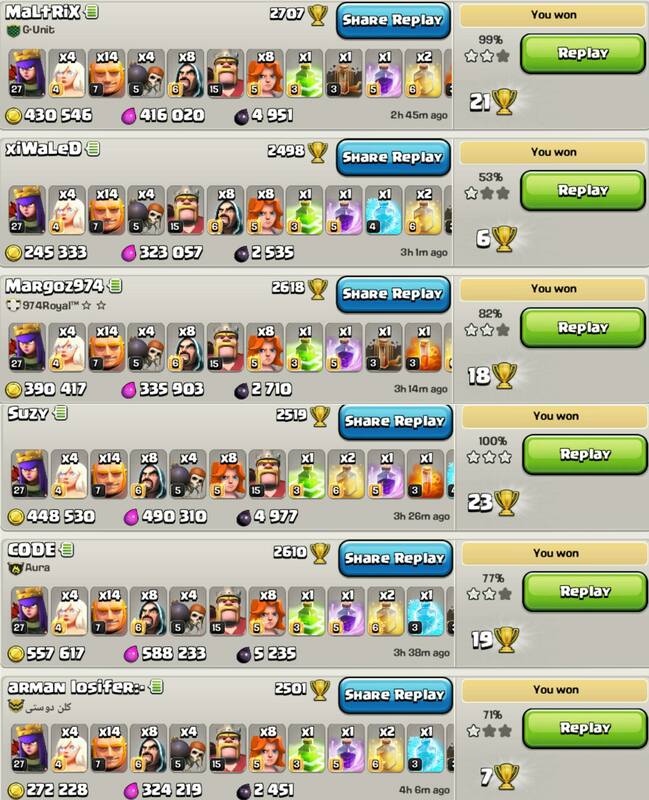 If you are in a higher league (trophies above 4000) then this farming strategy may not work as expected. You can also use this strategy in Town Hall 11. 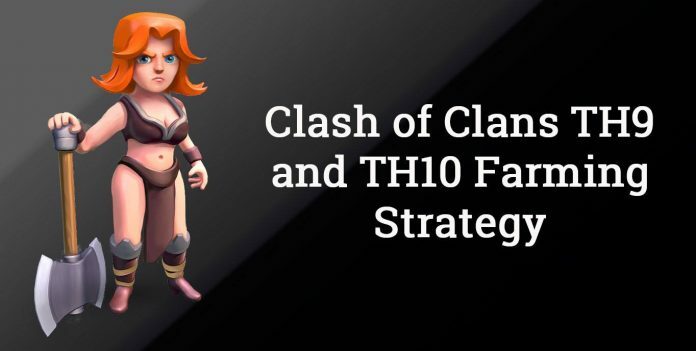 If you liked our COC farming strategy then please do share this post. Stay tuned with us to get more Clash of Clash contents, like war attacks, strategies, latest news, etc. Feel free to share your farming strategy in TH9 and TH10. Started using this army today…first time Ive used valkeries! (Always been an air raider). All I can say is it works awesome, great write up, thanks for the help!